Sensor technology innovator Professor Jim McLaughlin of the University of Ulster this week told a VIP audience at California’s Stanford University how healthcare technologies developed at Ulster has inspired a set of globally successful spin-out companies. Professor McLaughlin, who leads the University of Ulster’s Connected Health programme, highlighted to a large Silicon Valley audience the significant role Ulster has played in developing research and innovation capability with the new Northern Ireland Connected Health ECO-system. His talk at the top Silicon Valley university wasorganised as part of Stanford Engineering's European Innovation & Entrepreneurship Thought Leaders series, a weekly speaker programme bringing industry leaders from Europe's hi-tech startup, venture finance, corporate,university research and technology commercialisation communities to share their insights and experiences with aspiring and veteran entrepreneurs from Silicon Valley. Professor McLaughlin's invitation to Stanford came from Dr Burton Lee, a lecturer from the Stanford School of Engineering who is currently reaching out to form alliances across the world. He has visited most universities on the island of Ireland and he has admired the strong technology drive and impact that the University of Ulster has demonstrated over this past decade. 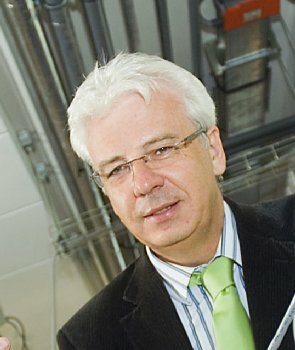 He has been especially impressed by the way Ulster's wireless sensing system, biocoatings, composites, tissue engineering coatings and photocatalysis have found routes into the commercial world. "I was honoured to present at this prestigious event and delighted to be able to highlight our pioneering work. Stanford University and Silicon Valley are a inspirational parts of the world and both the School of Engineering and our Engineering Research Institute are excited about building strong linkages via various Bio-Design programmes, as well as developing working partnerships with some of Silicon Valley's finest companies. " “The University of Ulster has a long history of undertaking research that improves the quality and safety of care to patients, their families and communities. "Our investment in connected health research and enterprise is a natural extension of this objective”.